↑ ୧.୦ ୧.୧ Moore, Keith L.; Dalley, Arthur F.; Agur, A. M. R. (2013). "Lower Limb". Clinically Oriented Anatomy (7th ed.). Lippincott Williams & Wilkins. pp. 508–669. ISBN 978-1-4511-1945-9. ↑ Milner, Brent K. (1999). "Musculoskeletal Imaging". In Gay, Spencer B.; Woodcock, Richard J. Radiology Recall. Lippincott Williams & Wilkins. pp. 258–383. ISBN 978-0-683-30663-7. ↑ Williams, D. S. Blaise; Taunton, Jack (2007). 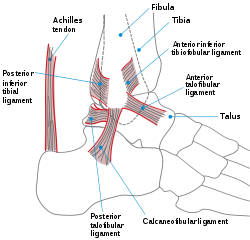 "Foot, ankle and lower leg". In Kolt, Gregory S.; Snyder-Mackler, Lynn. Physical Therapies in Sport and Exercise. Elsevier Health Sciences. pp. 420–39. ISBN 978-0-443-10351-3. ↑ del Castillo, Jorge (2012). "Foot and Ankle Injuries". In Adams, James G. Emergency Medicine. Elsevier Health Sciences. pp. 3124–66. ISBN 978-1-4557-3394-1.